I do like Weezie’s proactive attitude toward prophecy, at least in theory. I don’t think too many people have resorted to just Craigslisting a want ad, plugging in the traits that the Holy Scripture says the Messiah will have, and then getting all verklempt when somebody who meets the description actually shows up. As long as all you’re advertising is some minimum-wage job, you can probably keep the charlatans away. But the other drawbacks of this approach will make themselves clear soon enough. 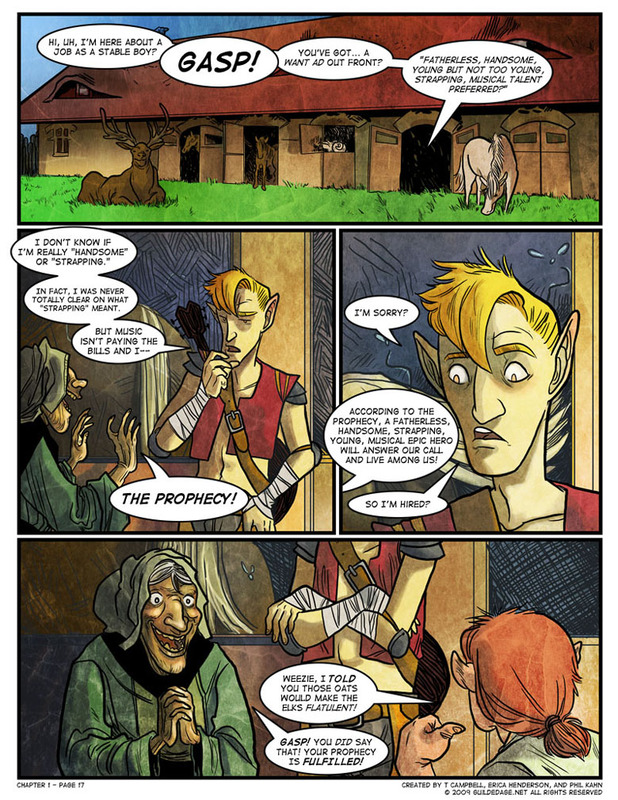 Take a good look at pre-prophecy Best here, I mean, really, check this out. Dude doesn’t even think he’s handsome, and the way he says “music isn’t paying the bills,” he probably doesn’t think much of his own talent right now, either. In the original script, Best’s section came last. Structurally, it’s the biggest surprise, as up to now, we’ve seen the backstories of the fighting five who faced off against Morbundi in the opening section. But who’s this guy? Is he somehow… going to turn into Bandit? So was Best always talented and just lacking in confidence or did something much more profound happen to change him beside the massive ego boost from being worshiped by the villagers? Is this when he became “inhabited” by his Sepia counterpart? I always figured this was the background sepia world Best wrote for himself. Best: “What!?!? No. Like a day. At Best. Let’s get this show on the road. Is it just me or does he resemble Sting? I don’t see it, maybe if he were drawn wearing facepaint? He looks NOTHING like John Constantine. I mean going from poor and desperate to having a cult and leaving it out of boredom is a very Constantine thing to do. It is interesting, how being told “you matter, that you are important,” can change someone in so many ways. Man, talk about self-fulling prophecies. You made an ad specifically for what the prophecy asked woman! And you’re surprised someone who fits the ad came asking for the job? Not if you wrote exactly the opposite on the ad and still got what the prophecy asked for, that would be something! When the prophesy so powerful, merely saying the word reshapes your nose. This…wasn’t a reply comment. Why did it put it here? I’ve always wanted to kick off a TTRPG campaign with the classic trope of the old man in the inn, who spots the PCs and tells them they’re fated to be great heroes, and to seek their fame and fortune and so forth in some remote location. And then, when the campaign is drawing to a close, have them pass back through the same town, and hear the old codger giving the exact same prophecy to some other group, while the villagers conceal their snickers–eventually they learn that that he gives the exact same spiel to just about every group of 4-6 strangers who come to town. Most of ’em just die horribly. It’s actually on the Evil Overlord List. Don’t send your legions out to seize the artifact of power you just learned about, that will draw attention. Send them out to seize something else and put a want ad in the local newspaper. I notice that Groomer Gurd has Winter Elf ears. Coincidence? I think not!